I did my first NaNoWriMo (National Novel Writing Month, 50k word novel challenge in November), and I did it in a very public way - at least with those who are closest to me. I emailed friends and posted on Facebook about it. I asked for input choosing which project to work on (I had several projects I wanted to work on, and couldn't really decide). So, when people actually did give me input, it made me feel like I owe them something in return. I have to win. (I.e., meet the 50K word goal, and finish the novel's rough draft). And I started out pretty cold. 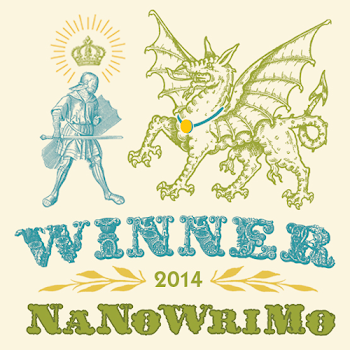 I had written a novelette that's a prequal to the novel, but I wouldn't use any of those 14k words for NaNo. I had an "Elevator pitch" for two short stories set in the same series, and I was going to tie those together for a novel-length narrative. Unfortunately, that didn't quite work the way I thought it would. Normally when I write, it's on my own timetable. I have not sold anything yet, and I've been working on my first novel for years. If I feel moved to work on a short story, I allow it, and come back to the novel later. I figured it would be difficult to find the time to write, but if I could make the time, 50,000 words would be pretty easy. After all, I'm generally pretty good at cranking out words. I've never really experienced anxiety or pressure about the blank page, i.e., writer's block. Until now. I started out strong, but by the end of the first week I had fallen a couple days behind. Half way through the month, I also realized that I was running out of story. I wasn't going to have 50K words, and the plot was about to be resolved. What else was I going to write? Historically, length has not been a problem for me, because I have tendency toward verbosity. I've been working on being concise this last year by limiting my short stories to 6k words. I even started using Twitter. And at the end of week two, it felt like I'd gotten too good at being brief. My scenes were running 400-500 words, whereas scenes in my first novel typically ran 2000 words. So, I did what so many writers have done before me. I freaked out. I'm staring at a blank page thinking, "What the hell am I going to write?" People are counting on me! Or, at least, I'd made promises, and would be ashamed if I failed -- after all, I want to be seen as a legitimate writer. If I'm ever going to quit my day job and write full time -- the endgame here -- I'm going to be in situations where I have a deadline to meet, with a novel-length work, and I may have other competing projects, deadlines, commitments as well. So, I'm freaked out, but I'm glad. If I can get through it, I realized, and meet my goal, then I'll be more confident in my ability to actually do this for a living. It boils down to developing my ability to manage my headspace. Some people say they work better under pressure. I've never really understood that. When I get emotional, anxious, I am less productive. I have trouble thinking straight. I learned in High School that if I calmed myself down I did a lot better on tests. Cultivating inner peace is a coping strategy I've used all my life, and I have a reputation for remaining calm in the face of adversity and conflict. So, I was able to break out of that panic and find tranquility within by remembering the tools I had at my disposal. I pulled out my Oblique Strategies app, which I've only used occasionally. I pulled two or three cards, pondering each one, until I came up with "What wouldn't you do." This card freed me to be really creative. I came up with a plot twist that would make me want to put the book down. What if my near future crime noir techno-thriller suddenly turned into a ghost story? The idea made me laugh. But then I asked myself how I could make the idea of ghosts work in the story. I decided that the next murder to take place would be made to look like a ghost had committed the crime. I searched online for a famous haunted location in Pasadena, and this gave me a new setting. While the detectives in the story don't really believe a ghost committed the murder, they each react differently to the notion of ghosts, allowing me to develop the characters a bit more. It even created a theme for me to revisit with later murders that take place in the novel. And I did it. I finished the novel over the Thanksgiving weekend without even putting in a really big daily wordcount over the holiday. It was awesome! Another thing I did was create a "novel soundtrack," collecting music videos in a YouTube playlist (more on this in another post later). I was inspired by hearing about and seeing how other writers used music in their novels, and I would listen to the growing playlist on endless loop to help me get or stay in the mood as I wrote. 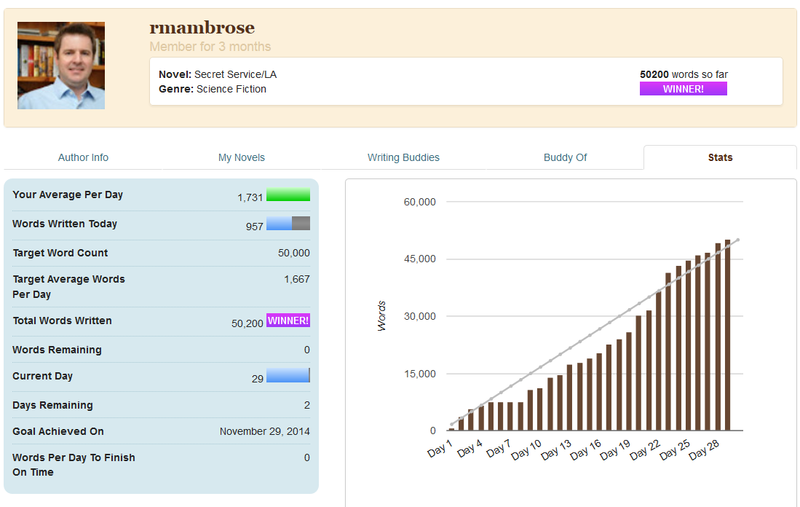 NaNoWriMo also strengthened the habit of writing. In the evening after I finished the novel, I found myself with an empty span of time, and I missed writing that novel. This is maybe the core lesson of NaNoWriMo for most people, and it is useful for me as well. However, my biggest takeaway remains managing my own creative process, figuring out how to work under pressure and stay productive when that panic hits. It's a transformative test for me as a writer, not unlike my black-belt exam in Aikido. And I look forward to doing it again next year.